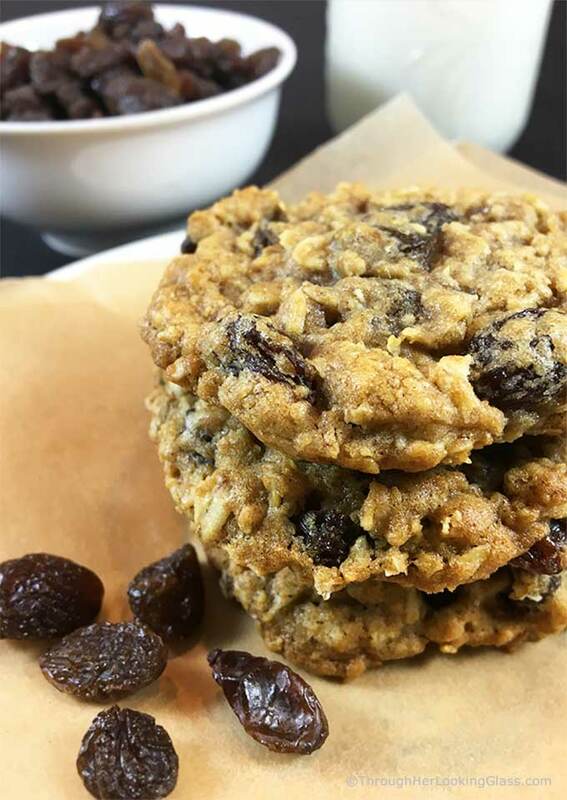 Chewy Oatmeal Raisin Cookies are a great snack to pack in lunch boxes and picnic hampers for a sweet treat with the goodness of oatmeal. Studded with plump, juicy raisins, they’re delicious and addictive, just like grandma’s. We’ve had a busy new year so far and I’m guessing you have too. We’ve had some good storms, a few school delays and cancellations, and the snow gave way to rain today. 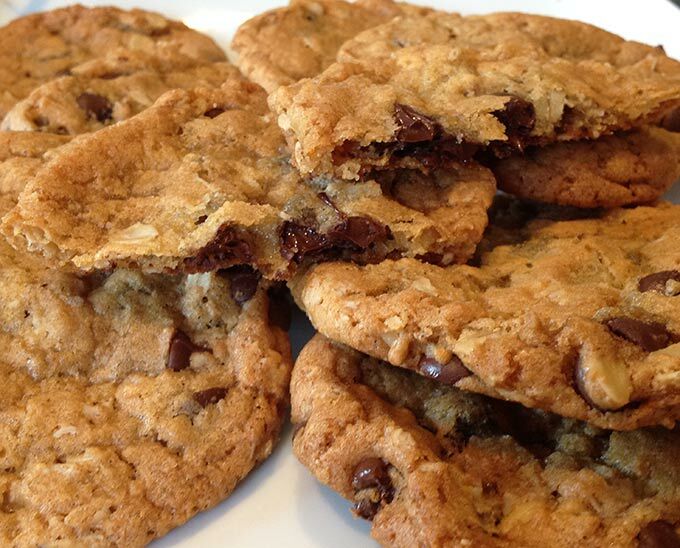 I can’t think of anything more delightful on a cold, rainy day than baking a batch of these homemade cookies. Several summers ago we ventured up to Castle In the Clouds, the historic Lucknow Estate in Moultonborough, NH. It’s just a little over an hour north of us. If you’ve never visited, it’s the 6,300 acre estate with the Lucknow stone “castle” at the mountain’s peak. Such fantastic and scenic views of Lake Winnipesaukee. Built by Thomas Plant in 1914, it’s a “gentleman’s estate”. Features a sixteen room mansion, stable, two gatehouses (what exactly is a gatehouse anyway? ), a one hundred foot long greenhouse, farm buildings, an 18-hole golf course, tennis court, lake and 45 miles of carriage trails. This is a nature lover’s paradise. Thomas Plant’s story is quite a fascinating one of rags to riches to rags again and it all came of shoes. I’ll tell you more about that in another post. We toured the castle, visited the gift shop and carriage house and hand fed the large trout that jump up out of the water for fish food at Shannon Pond. There were as many ducks as fish clamoring for the food! 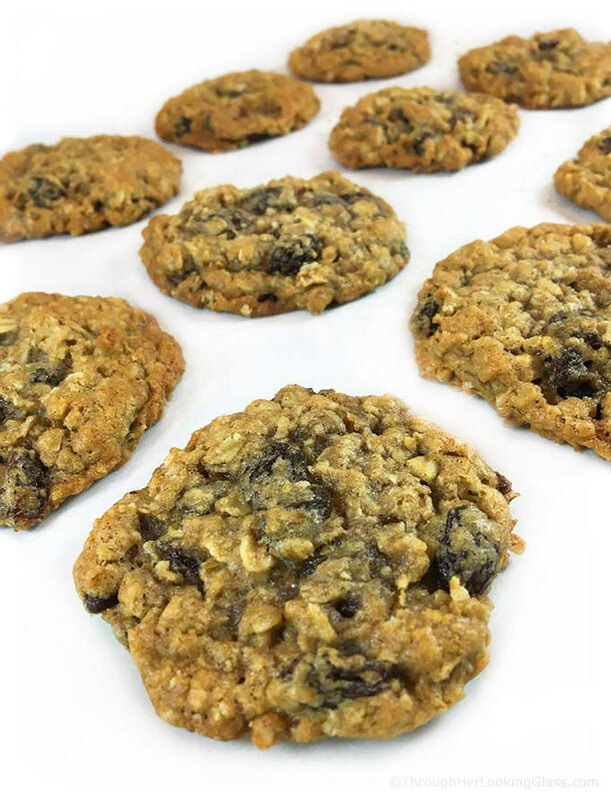 We toted along a picnic lunch with sandwiches, fresh fruit salad, chips, salsa, lemonade and these delicious Chewy Oatmeal Raisin Cookies for dessert. Such a beautiful shady spot we had to enjoy our picnic lunch at Castle in the Clouds. These cookies have all the goodies: butter, sugar, eggs, oatmeal and pure vanilla to name a few. But in my opinion, it’s the cinnamon that ties this cookie together so nicely. 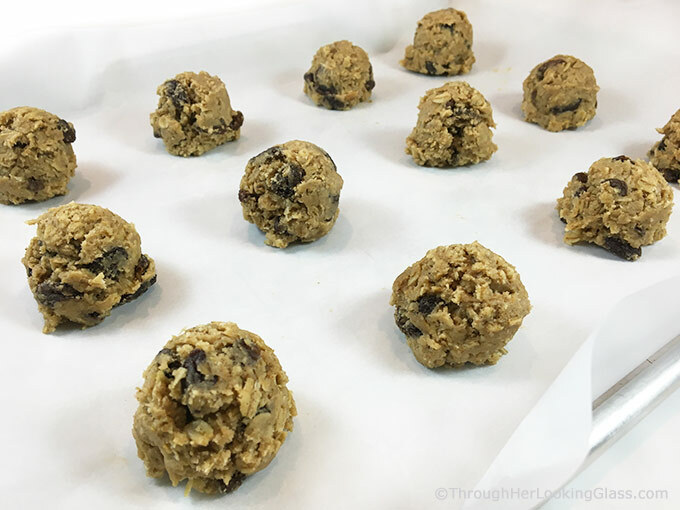 I used a heaping tablespoon of dough to make larger 3″ cookies. You can make them smaller if you like. They spread a good bit, so you’ll want to leave plenty of space in between. 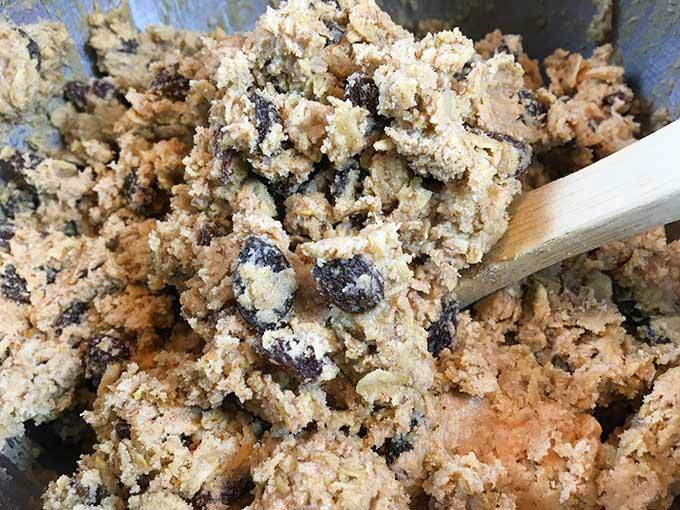 This recipe makes four dozen scrumptious 3″ oatmeal raisin cookies. Enjoy! In a large bowl, cream together butter and sugars . Stir in eggs and vanilla until well combined. Stir in remaining ingredients, adding raisins last. Drop by rounded tablespoonfuls onto ungreased or parchment lined cookie sheets, leaving space in between for spreading. I like my cookies flatter, so I pressed the dough down with a small drinking glass. Bake at 350° for 10 - 12 minutes until lightly golden brown. Allow to cool on cookie sheet for a few minutes, then transfer to a wire rack for complete cooling. Now that that sounds like a lovely day with the cookies being the icing on the cake! I have never been to Castle in the Clouds. I think I need to go now. Sounds beautiful. Having a picnic up there really must have been nice. Especially your picnics! Thank you for telling us about your day and especially the cookie recipe!!! Yum! These are my kind of cookies!Can't wait to try 'em! What a fun day you had! I do love summer adventures. :) Your oatmeal raisin cookies look absolutely scrumptious...can't wait to try them! Ta recette de cookies Allie et tes photos sont de véritables invitations à la gourmandise ! j'adore!bises,belle journée! No picnic would be complete without some cookies for dessert and these look perfect! Yum, these sound delicious, and I looked at the web site for the Castle in the Clouds. What a beautiful place! Much as I love chocolate, oatmeal raisin cookies are at least in my top 5 cookie favorites. There is nothing like oatmeal raisin cookies with a tall, cold glass of milk or iced tea. Lucknow is the name of an Indian city as well! Castle in clouds sounds so much fun. Picnics are so much fun indeed. And these chewy cookies are just WOW! No wonder they are so addictive. Loved the juicy addition of raisins here! I totally understand about having a short good weather window. It's the same here in MA. I feel like we try to cram 6 months of fun outdoor activities into 3 months. These Chewy Oatmeal Raisin Cookies could definitely help me forget about it and take me to my happy place! Yum!! 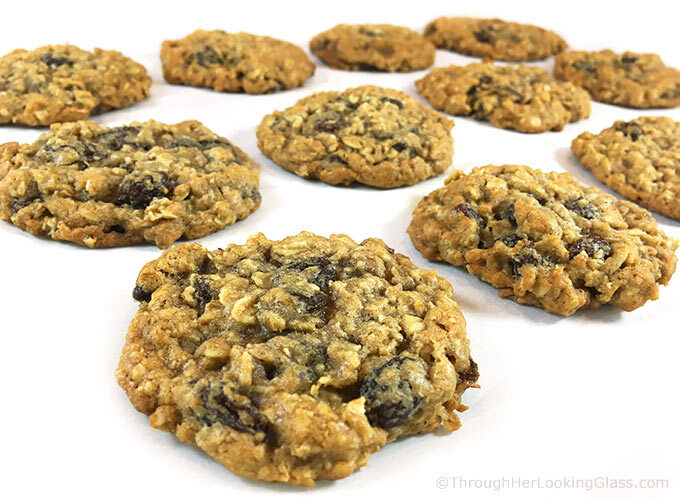 these are the best oatmeal raisin cookies i have ever made, the only adjustment i made was 2 c old fashioned oats and 1 c quick cooking oats and beacuse i ran out of old fashioned. seriously the best i have ever had. Awesome!!! I'm SO happy, glad they were a big success Priscilla. I just made a batch of these last week and they disappeared fast at my house. Thanks so much for dropping by! I made these cookies last night, but they were soooo sweet we couldn't enjoy them. They came out beautifully going to try the recipe again with Jess sugar. Hey Nikki - thanks for the feedback! Would love to hear how they turn out with less sugar! Happy baking! This cookie recipe is just perfect and so timely! My Denver crew will be visiting us in NH next week —I know they will LOVE these cookies. I’ll be sure to double the recipe. Thanks for the inspiration,Allie. Hi! Because of your original post about Castle in the Clouds , my husband and I visited Moultonborough on a trip we to to lake winnepesaukee. It was beautiful!!! The views and gardens were breathtaking. We live in Massachusetts, but spend a lot of time in New Hampshire. 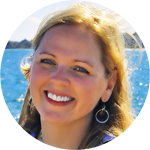 I love your blog, it’s wicked awesome! Thank you for sharing stories about your wonderful family, and your delicious recipes. I will be making these cookies for Super Bowl Sunday! Go Pats! There are so many fancy cookie recipes nowadays but an old fashioned oatmeal raisin cookie is still my favorite. What a nice castle. We also have quite a few around here and we like to go visit from time to time. Although we have seen so many already, there are still loads left and we never seem to get tired of them. I like visiting the rooms in the castle (especially if you have a guide or something to read in the hand), but my favorite part are always the gardens or the woods around them. I am definitely not a garden person otherwise and nature wanderings are also not a hobby, but when it comes to this kind of estates, it is so great! The cookies look delicious, I wouldn't say no to some right now!